After several years away, Topps is back on the gridiron with 2019 Topps Alliance of American Football cards. The debut set covers the new eight-team AAF league and each Hobby box contains three autographs. Getting started one week after the NFL Super Bowl, initial teams include the Arizona Hotshots, Atlanta Legends, Birmingham Iron, Memphis Express, Orlando Apollos, Salt Lake Stallions, San Antonio Commanders and San Diego Fleet. 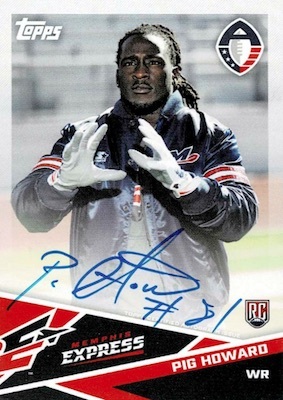 Chances are pretty good that you will recognize some of the AAF players and coaches and the 2019 Topps Alliance of American Football checklist features 175 of the best options in the base set. There are also Red (#/99), Blue (#/50), Gold (#/25), Green (#/10), Purple (#/5) and Black (1/1) parallels for each card. Notable players include Aaron Murray, Christian Hackenberg and Josh Johnson, while collectors can also find Mike Singletary and Steve Spurrier as league coaches. The Future Stars inserts average 1:6 packs and highlight possible AAF standouts. These have Gold (#/25), Green (#/10), Purple (#/5) and Black (1/1) parallels. However, the standout of the simple release is the on-card content. 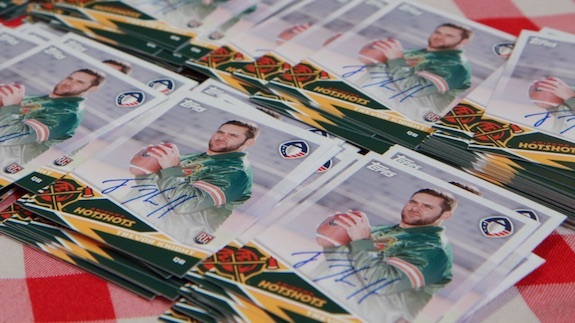 Falling at a rate of three per Hobby box, the hard-signed cards are the preferred route for most collectors and likely to be popular with AAF fans. Low-numbered editions include Purple (#/5) and Black (1/1) parallels. Donteea Dye Jr. 2019 Topps AAF Alliance of American Football SP Autograph RC! 2019 MALACHI JONES TOPPS ALLIANCE OF AMERICAN FOOTBALL AAF AUTO AUTOGRAPH!! 2019 DEMARCUS AYERS TOPPS ALLIANCE OF AMERICAN FOOTBALL AAF AUTO AUTOGRAPH!! 2019 MEFFY KOLOAMATANGI TOPPS ALLIANCE OF AMERICAN FOOTBALL AAF AUTO AUTOGRAPH!! 2019 JOSH WOODRUM TOPPS ALLIANCE OF AMERICAN FOOTBALL AAF AUTO AUTOGRAPH!! Shop for AAF Hobby boxes direct from Topps. 175 cards. Buy complete sets on eBay. PARALLEL CARDS: Red #/99, Blue #/50, Gold #/25, Green #/10, Purple #/5, Black 1/1. 104 cards. 3 per box. Buy 2019 Topps AAF autographs on eBay. PARALLEL CARDS: Purple #/5, Black 1/1. PARALLEL CARDS: Gold #/25, Green #/10, Purple #/5, Black 1/1. View the 2019 Topps Alliance of American Football AAF checklist Excel spreadsheet. HOLY CRAP TOPPS IS BACK (kinda)! This is cool to see, I had no idea AAF was even a thing until I saw this post lol. By the look of it, there’s some solid talent in the league, picking up some autos will be really cool. As long as the price is right (no more than ~$10 per auto), this will be an awesome gridiron comeback for Topps! 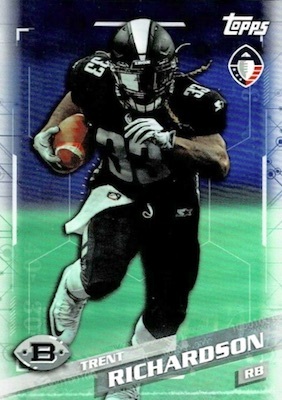 I hoped that the AAF would get an official card set– but I must admit that I am extremely disappointed in Topps’ decision to include so many short-print parallels, particularly the 1/1s … As a fan of “alternative” leagues like this, my goal as a collector would be to build a master set– but, of course, that will be literally impossible in this situation … I’m not sure who Topps thinks will be the target market for these cards. Do they seriously expect alot of case breakers?? Most of these parallels will probably never ever surface … Oh well. I suppose I should avoid these cards (and the accompanying frustration) altogether. Will rate once I feel the card quality. Hard signed autos is nice but most of these guys will never make the NFL so the price of a hobby box is too high. When will we get a look at the actual checklist? The cards come out in a couple days but still no true checklist? I pre-ordered two of these hobby boxes and I am really excited. Three hits for under $60 is still a solid deal. If the league continues this could be a valuable set and even if it doesn’t, like the 2001 XFL cards, these cards become somewhat of a find and people desire them like the 2001 XFL cards. These cards allegedly were supposed to be out 2 weeks ago. No news from Topps. The estimated release date changed to March 22. This happens quite often in the card world. No Terrell Watson??? I don’t get it. Sorry. The design is fine. I was looking at something else. I think the base design and the autos look really cool, but the only issue I have with the auto set is that Garrett Gilbert (arguably mvp of the league) and Charles Johnson(the best WR of the league) don’t have autographs. Just bought a blaster box today,nice cards. the colors? Thanks for any insight on this! The indicated numbering is still correct. The main green parallel is a darker color version numbered to 10. The gold is a lighter green with gold/yellow clearly visible on the side and a print run of 25. You don’t even have one of the top players in the league Karter Schult isn’t even listed so he doesn’t have a card. Correct. Topps did not include Schult in this set. He does have a Topps Now card. Cards are nice but now the league is defunct. So much for hoping for future USFL prices. Kidding. Looks like a complete loss for Topps. I’ll wait till Walmart puts these at 5 bucks per blaster.